A node type is just a node, so creating a new node type follows the same approach as creating any other node. In this example, Jane creates a new node type to hold details about food. The new node type will initally only contain a name and description. To create a node type, she navigate to the system.TYPE_TYPE node at https://www.metrici.com/system/TYPE_TYPE, clicks on More to see the menu panel, and selects New Type. The form to create a new type is similar to the form to create a new constant, but with some extra fields. For types, the most important field is the Member Type List which lists the member types to be used for the new type. 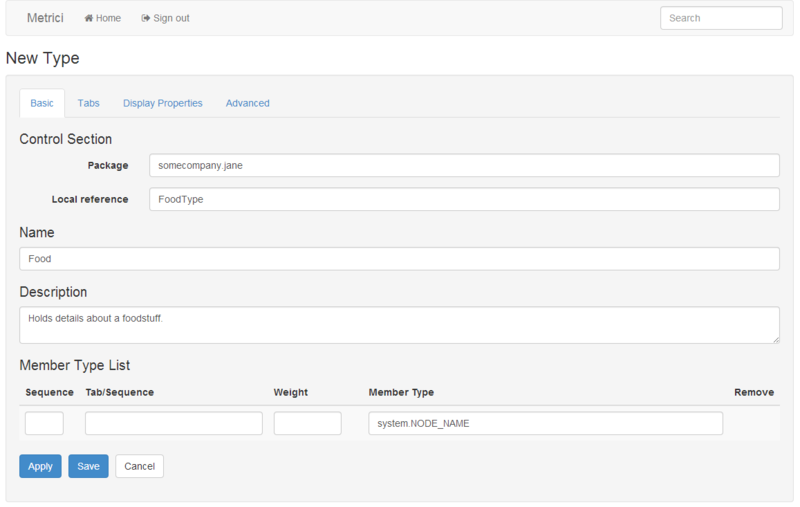 Jane fills in the local reference, name and description, enters system.NODE_NAME in the member type list, and clicks on Apply. After she has pressed apply, the Member Type List will have an extra space to enter a new member type. She enters system.NODE_DESCRIPTION and clicks on Save. When she returns to the Food node, the menu panel will have a New Food link which she can use to create new nodes of type Food.